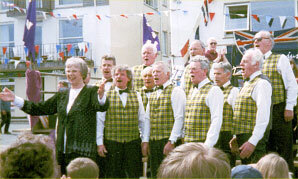 Cornish Connection was founded in Liskeard in 1984 and soon after it moved to St Austell where it has been based ever since. 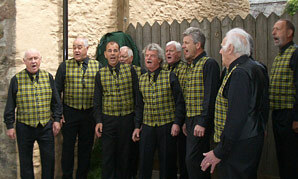 We sing songs in barbershop style i.e, 4 part harmony a ­capella, (without accompaniment). We encourage congenial men of all ages and good character to sing barbershop, in a spirit of good fellowship. We are happy to give consideration to any appropriate venue that is willing to let us show what we can do, including private functions by arrangement. The expression of political, religious or other controversial issues are not permitted in our chorus. Our aims include entertaining people, promoting this art form and encouraging other men to join us and bring the joy of barbershop singing to the wider public. If you’d like to join us visit our Join page. If you like to sample some of our songs you can have a listen on our Songs page.